Purim this is more about the mystical levels of the holiday and how it is relevant to us. You might also want to sit with the meditation podcast I recorded this week for the holiday. I think the essence of the teaching is relevant to everyone regardless of our many religious/spiritual beliefs. And for the silly aspect of the holiday here are two photos of my dog Ellie, doesn't she look ominous in the first image? And then well, you can see she's a total poser when you see her up close. Definite poodle luv!!! Now I am going to go find that meditation. Your photos are wonderful! Lovely photos as always. I think I can smell hamantashen! "it is an escapism not from reality to fantasy, but from our fantasies of stability to the reality of chaos." I am proud to be, at least referentially, linked to the trio of Esther, Judith, and Ruth. Thank you for the Purim lessons. Yes, delicious photos with an exquisite combination of light and color. Pure visual poetry. Oh my, what a beautiful post. Thank you for sharing. Your dog is really cute too. Have a great weekend and thank you for stopping by pret-a-vivre. I love the contrast between the orange leaves and the lively blossoms. 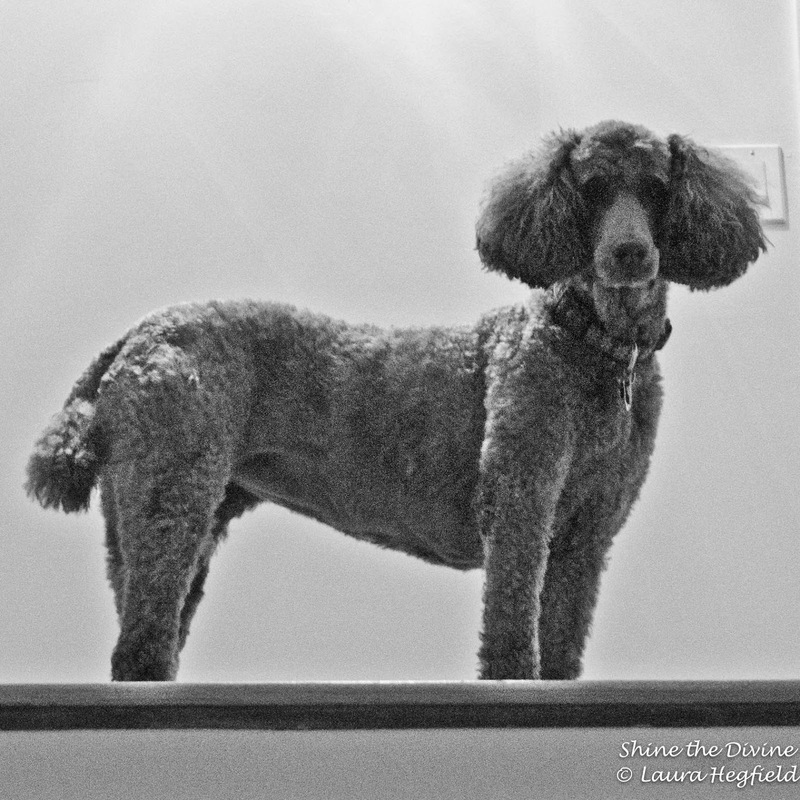 Your B&W shots of your dog Ellie are cool too. Blessings! oh! what a treasure to find this little bit of early spring. Your dog is a poser, I think it's in the breed. My friend has poodles, those BIG personalities! Ellie is such a beauty!!!!!!! Interesting sounds and word choices. I like pulsing, pushing boundaries. Beautiful pictures. Love the photos of your dog! Wow! What a beautiful post! The second shot is my favorite. Great detail. Ellie is adorable and those shots of the perfumed flowers just amazing! So beautiful. I love your pictures very much! Best regards, Lotta. One can really see and feel God's work in your post. Thanks for wonderful words and awesome pictures. Beautiful words and images !!! I like that first photo of your dog - excellent lighting! Great post Laura and an even better finish with the "poser"! This is such a sweet post. Thanks for sharing. Such beautiful photos, and how wonderful that you have a little blossom already. I can't wait to see little buds and shoots here! Ellie is lovely! Happy Critter Day! Another lovely post, Laura! Ellie is a cute dog! Great shots! Love the one with Ellie at the top of the stairs. vad roligt att den blommade så fint och för mig tidigt. You have some lovely photos. Thanks for sharing! Oh my goodness, Laura, Ellie is just beautiful. Wonderful photographs with such beautiful light in each one. Thank you for sharing on Weekly Top Shot #71! 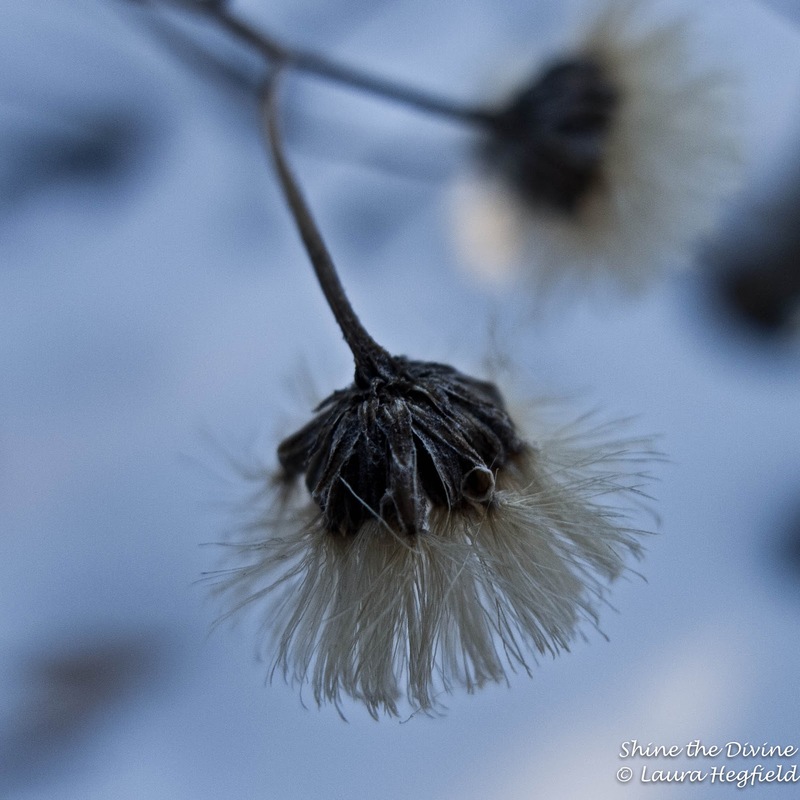 Dear Laura, thank you for sharing your incredible photography with us and for linking to Today's Flowers. Ellie is a sweet little dog and poses beautifully, and your header photo is also stunning. I love how the light shines through the leaf. I shall also enjoy reading the links. Great post! I love the pictures of Ellie! oh my....it's hamentachen time...it always sneaks up on me! so nice to meet you! thank you for stopping by my place and saying hello...i'm adding you to my reader now! very cool shots of your pup! the first is really awesome! Spectacular myrtle blossoms. It looks like a button sewn in the middle and I love the leaf elegance. Congrats on blogging for 5 years...that is a big accomplishment!! Ellie is a doll baby...love her.Thanks for the encouragement and light you spread here. Hi there - I really like the ice on the branch. I'm not really that much of a fan of pet pictures - but the first image of your dog is really different - I like it. Great captures of the flowers. Beautiful. Your seventh photo is my favourite. The white flower is pretty special to me. Love the fringes. I love all the flower shots! Beautiful dog, like the photos! I loved your photography. YOu have a way of looking at things and seeing beauty from every angle. You gift the reader with the joy of the 'up close and personal.' Oh, and I love your dog pictures. Ellie looks like a sweet presence in your life. Happy holiday to you, Laura. Lovely shots and your words are full of hope. Wonderful photos. Hope you'd find time to visit my entry. Swoon...I have to read it again! Perfect words for some beautiful pics. I'm so glad I made my way here... such a lovely poem and I accept the invitation to joy! The photos are beautiful. And I'm so happy to have seen your link to the Buddha Chick magazine... triple blessings on this lovely Sunday morning! Thank you. 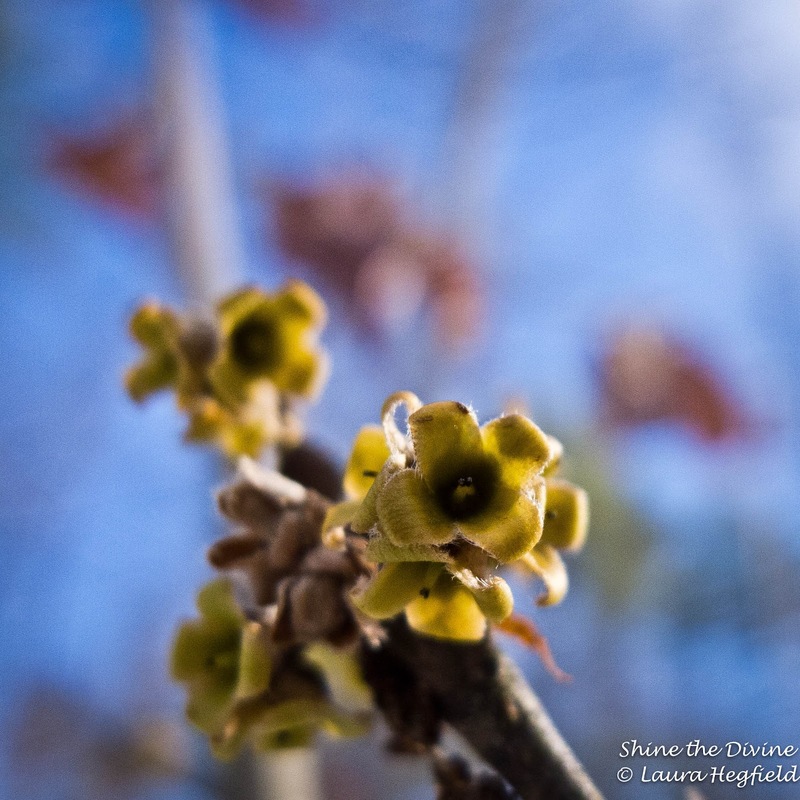 What joy to find those branches announcing spring's imminent arrival! Chag Sameach to you too!! And - what a surprise to find those spring blossoms!!! A mystical, beautiful poem on this holiday. Beautiful pics! A late visit from OYGIF. Our preacher preached on Esther just yesterday! Have a good Blue Monday, Laura. Fantastic shots ! some of them could be a painting ! Great poetry, and I just LOVE the pictures of the flowers! Wonderful shots. I played too. Mine are here and here. Beautiful nature pictures Laura! Ellie is so adorable and is quite the poser :-) Wishing you a wonderful week. A terceira foto ficou graciosa por demais!!! Beautiful shots and poetry, they really do pose for the camera don't they, yours is adorable. "an invitation to joy" is lovely... and rubbing those poodle ears between my fingers is a great start to my morning (have you ever seen a photo of my Golden Doodle? He look like a standard poodle ... with a bit more "heft" and a long Retriever-like tail. Lovely forest photos... I love your early morning photography. Beautiful images! I love the colour series. A great looking dog! I love the silhouette at the top of the stairs...wonderful! The shots you took in the forest are so beautiful! Thanks for your visit and kind words in my blog. Sorry for my absence. So many things to be done and so little time to do everything!